All-Ireland medal winner and AllStar Tony Scullion has done everything in football, and he thought he had seen everything as well. But he hadn’t reckoned with Slaughtneil! “What an absolutely truly amazing achievement. I’m proud to be a Derryman and one who lives not very far from Slaughtneil and I am over the moon about it” stated the Ballinascreen great in the wake of Sunday’s tremendous victory for The Emmets over Kerry legends, Austin Stacks. “It’s genuinely nothing short of a fairytale story, a great, great achievement for a a tiny wee club, but a terrific club - and, like my own, they are a dual club and nearly all of those boys are dual players. What I mean is that Slaughtneil Emmets is a real GAA club. 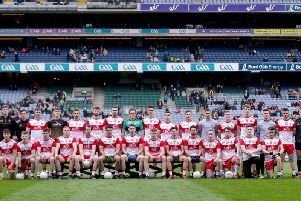 “I think people outside of dual clubs maybe just don’t appreciate what a feat it was for them to win both the county championships and then win the Ulster football and only be beaten in a semi-final replay in the hurling. It’s phenomenal. “And they are very far from an overnight success. I only live five or six miles away and I played many, many times against them in both hurling and football and both teams always went hell for leather for an hour, but you always shook hands before the game and after it , despite being like enemies during the action. “I am really honoured and delighted to be able to say that about a magnificent club and a marvellous community, because the people are superb” added Scullion, who admitted that, despite expecting them to emerge victorious, he could hardly believe the incredible character displayed in Sunday’s remarkable semi-final.